The days are not just short at the Pole; they don’t exist. The entire area north of the arctic circle is now sunless, 24 hours a day, and in terms of the planet’s heat budget the area is spending like a drunken sailor. Colossal amounts of heat is being exported upwards to Alpha Centuri, where they don’t need it. What our president should do (as he is a madman who thinks he can control the weather) is to make it illegal for any warmth to go north. It is a complete waste to send warmth north this time of year. Keep the warmth down south where the people are. Let the north get so cold that it freezes the arctic sea-ice thick, and has no further warmth to squander, even from the Arctic Ocean. In terms of the planet’s energy budget, it can be fifty below up at the Pole, and all it means is we are not wasting our warmth. Unfortunately our poor president doesn’t have a clue, when it comes to budgets. In actual fact whomever of the Creator’s angels is in charge of the weather has kept a lot of the cold up there recently. The O-buoys 8b, 13, 14, and 15 (with blinded cameras) have been reporting temperatures down near -40° C. This has occurred because, on the Asian side of the Pole, we have seen something close to a “zonal flow”, where winds describe a nice, neat circle around the Pole, and the jet stream doesn’t form the grandiose loops south and north that can bring snows to Florida even as cherries bloom in Scotland. On the North American side the jet stream did loop south, bringing record snows to places like Denver, but from the Atlantic to the Pacific over Eurasia the flow was fairly flat. Great surges of relatively mild Atlantic air surged west to east. I called one a “javelin” in another post, but they were more like snowplows, pushing the Siberian air left, right and forwards. The supercold air that went right became involved in a counter-current, east-to-west, and also involved more moisture than cold deserts usually see, so there were record snows from northern China and the Gobi Desert in Mongolia back to Turkey. There was even winter in Uttar Pradesh in northern India. This demonstrates that it is not just the Pole that is squandering heat. Areas south of the Arctic circle may see some sunshine, but a four hour day cannot make up for a 20 hour night, especially over Siberia when the snow-pack is deep. All that nice Atlantic air heading west-to-east gets colder and colder as it moves into and across Russia. All the Atlantic air does is supply unusual moisture and make the snow-pack deeper. However the thrust of Atlantic air does shove a lot of cold air to the left, north towards the Pole, and -15°C is better than -60°C, if you happen to live in Siberia. I’m sure they appreciate lower heating bills, the same way everyone else does, and with so much cold trapped up at the Pole, it has been a Christmas Miracle to the poor in the eastern USA and much of Europe to pay so little staying warm. In order for a zonal flow to persist it has to be even all the way around the Globe. Otherwise some of the very cold arctic air moves south and comes in contact with nice, juicy air over the Atlantic or Pacific, and “bombo-genesis” occurs, and you abruptly see an enormous gale on the map. The gale is so huge it tends to bend the jet stream north and south, and before you know it your nice, neat zonal pattern has been utterly messed up, and becomes a meridenal pattern. This seems to be what has happened recently. A huge gale blew up in the Aleutian Sea, followed by a teleconnected gale in Fram Strait. I hope to find time to post all the maps tomorrow, but for now will merely mention that Faboo (the North Pole Camera) has experienced winds over fifty mph, has made it south of 77.5° latitude, and (somewhat amazingly) the cameras are still functioning and producing regular photographs of ink. A tip of the hat to the bloggers Craigm350 and lectricdog, who sent us these links. The gale, with hurricane force gusts, is described as the worst to hit Longyearbyen in 30 years. I bring up this particular storm to illustrate the massive amounts of mildness and moisture brought north, to be squandered in the ink. In the following DMI maps you can see the milder air push north into the Pacific side of the Pole, even as very cold East Siberian air oozes north and across the Pole to Canada, and then the Svalbard Bomber blowing up in the Northernmost Atlantic. 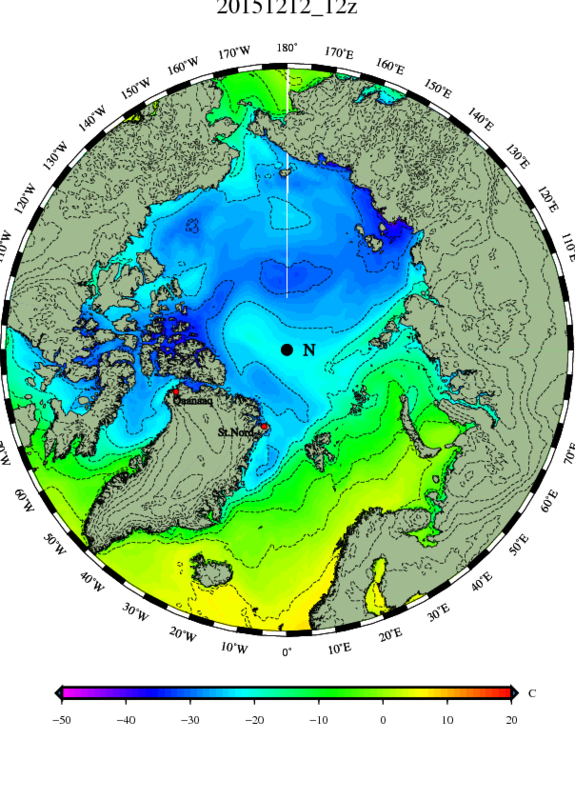 A lot of the arctic cold, when it hasn’t remained trapped over the Pole, has poured over the Pacific east of Russia and then made its way south to the Western USA. More has flooded south down either side of Greenland, occasionally crossing the Atlantic to chill northern Scandinavia, however mostly it has been ocean waters that have borne the brunt of winter rather than people. This looks like it will change. Though there is no snow in the eastern USA the snowpack has built in Ontario south of Hudson Bay, and the snowline looks likely to leap southward at the start of the New Year. Europe may dodge the bullet a bit longer. The weakest ice around the Pole is the newest baby-ice, perhaps only three inches thick, extending outwards at the edges, and the one thing that can discourage the growth of such ice is a roaring gale. We have seen two, if you generalize. If you want to count the gale’s secondary gales the number is higher. Such roaring winds can take a square mile of sea-ice three inches thick and crunch it like an accordion to a far smaller area of jumbled slabs. It is strangely similar to what happens to a flat summer beach, long merely lapped by gentle ripples, when it is hit by several autumnal gales and hurricanes. It is flat no longer. A big dune rises just inland, and a big off-shore sandbar rises just out to sea. In fact, if you look at the very edge of the sea-ice when the sun first returns to the north it is uncanny how smooth the edge looks, as opposed the more usual blocky look of broken-up sea-ice. It has all the curls and capes and inlets of a sandy shoreline, and hints at how pulverized and fluid the ice became during storms in the ink of winter dark and winter gales. During calms it expanded out as thin baby ice, but during storms it was reduced to many small chunks, basically a soup of slush. If you pay attention strictly to “sea-ice extent” without paying attention to what the sea-ice is undergoing, you will be puzzled by times the extent shrinks even when temperatures are below, and sometimes far below, the melting point of salt water. Once you pay more attention you expect the charts to dip, or at least flatten when the ice is subjected to super-gales. And indeed we have seen the extent flatten, both in the DMI 15% extent graph and in the DMI 30% extent graph. I try to keep two things in mind, during such occurrences. First, there may be just as much ice, but it is heaped up into a smaller area, like an oceanic sand dune, or like all the snow on your driveway being shoveled to the edges. Second, the creation of more open water cannot result in any warming of the water when the sun doesn’t even shine. In fact the water is often churned and chilled to a considerable depth by the howling gales, and this process will continue until either the water is sheltered by a roof of ice, or the sun starts beaming over the horizon and rises high enough to penetrate the surface. In any case, calculating the energy budget of arctic waters is no easy thing, and one should avoid the knee-jerk reaction of certain simpletons, who see a dip in sea-ice extent as a sure sign of warming. Faboo (my name for the North Pole Camera) may only represent a small chunk of a vast Arctic Sea of bergs, however I feel that the study of Faboo’s antics at least gives us an iota of an idea of what is going on, where we otherwise might see only ink. On our last post on December 12 Faboo had slowed down a lot, and drifted another 5.81 miles SSW to 78.494°N, 8.274°W. Temperatures had dropped to -28.5°C, and the hoarfrost had grown so thick that apparently both the wind-vane and anemometer were immobile. The cameras likely had encrusted lenses, and produced nothing but pictures of ink. On December 13 the buoy sped up, moving 12.21 miles nearly due south (but slightly west) to 78.317°N, 8.292°W, as temperatures nudged up to a high of -21.5°C at 1500Z. On December 14 Faboo crossed 15.31 miles a little west of due south, reaching 78.098°N, 8.471°W. We can assume the winds were picking up. Temperatures were basically flat, with a low of -22.5°C at midnight rising to a high of -20.1°C at 0900Z before creeping back down again. On December 15 we veered a bit to the SSW, covering 11.34 miles and arriving at 77.935°N, 8.602°W. Temperatures crept down to a low of -24.5°C at 1800Z. On December 16 we experienced a bit of a lull, moving only 8.24 miles to 77.953°N, 8.588°W. However in Fram strait such lulls, combined with the fact temperatures steadily rose to -18.8°C, make me suspicious warm air is surging north and a storm is brewing. On December 18 the Svalbard Bomber had steady winds of over 40 mph for most of the day, peaking with a steady gale of 51 mph at 0300Z. There was an interesting lull at 1500Z, when winds dropped to 13 mph. Temperatures at that point had fallen steadily to -9.2°C, but at the 1800Z report they’d sprung up to a high of -1.5°C, and winds were back up to 40 mph, and ended the period at 45 mph. We moved an impressive 27.93 miles SSW to 77.429°N, 10.921°W. On December 19 the gales blew all day, only slacking to 38 mph at the end, as temperatures steadily fell from -3.0°C to -13.3°C . Faboo charged another 31.71 miles SSW to 77.004°N, 11.716°W. On December 20 the Svalbard Bomber faded east, and winds slowly decreased from gales to a strong breeze of 20 mph at the end, as temperatures remained fairly flat, with a low of -13.7°C at noon and a high of -12.6°C at 1800Z. Faboo moved 21.1 miles further south, arriving at 76.710°N, 12.090°W . On December 21 winds faded further, down to around 11 mph, and the flat temperatures took a plunge to -21.5°C at the end. The ice began to rebound to the east, after being crunched up against the coast of Greenland, which makes me nervous, because it was during such a period of rebound, after a gale, that we lost O-buoy 9. I imagine leads open up. 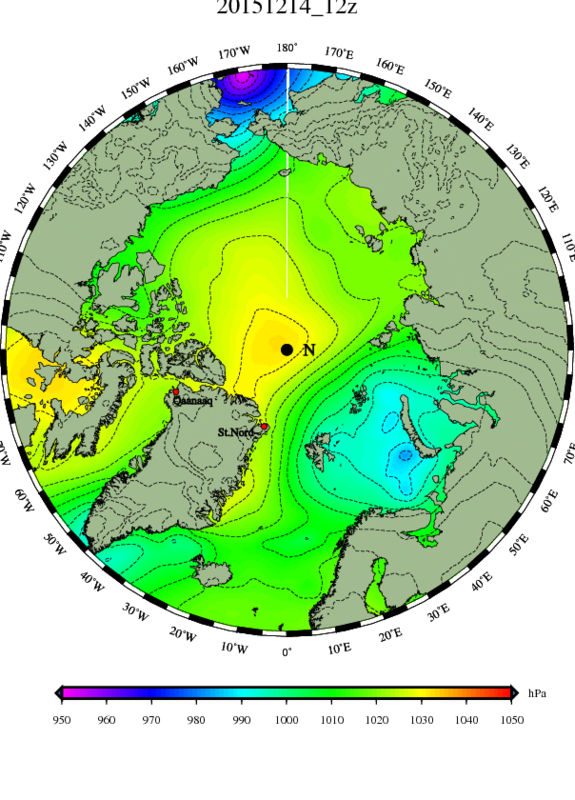 Despite the slackening winds Faboo moved another 11.4 miles south to 76.547°N, 11.970°W. The gales up in the arctic have done a good job of compressing and chewing away at the outer edge of the sea ice both on the Atlantic and Pacific side. Despite the cold winds blasting off east Siberia and down either coast of Greenland, there has been little chance to grow the fragile ice at the edges, and graphs focused on the extent (or area) of the ice show a slump or leveling-off, both on the DMI 15% and 30% graphs. Besides the compression of sea ice, there has also been warmth that has been a blessing to those who pay heating bills, eroding the snow-cover in the east if the USA right up across the border into southern Ontario and Quebec, and across Europe right into Russia. Of course such mildness holds moisture, and once such mild surges move a certain distance across northern landscapes temperatures can be above normal but chill to a degree where they still build the snow-pack, which has happened in the rest of Russia, and also in northern Ontario and Quebec and even Northern Maine. Also such surges, in Eurasia, have led to an interesting backwash the other direction, a sort of counter-current bringing snows to India, Pakistan, Iran and Turkey, and even Romania and the Italian Alps. That snow-pack is a winter-breeder, as it reflects the wan winter sunlight during the short winter days, and during the long nights radiational cooling is at its yearly high. 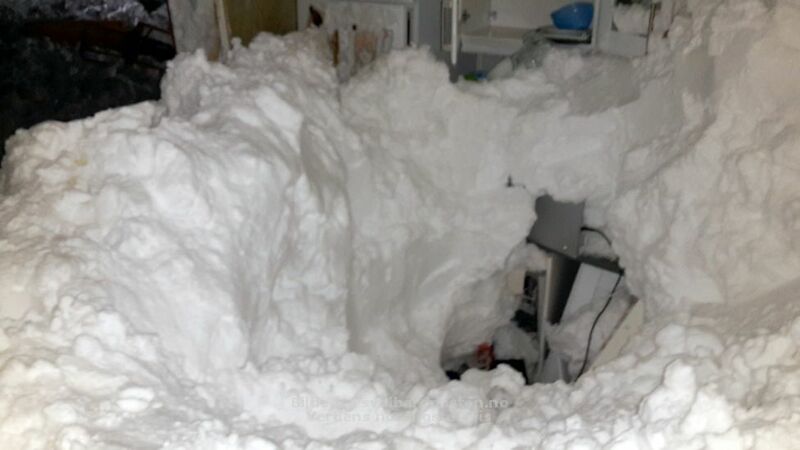 Deep snow to your north is not a friend, if you yearn for a mild winter. At the very top of the above map is southernmost Hudson Bay, which is only slightly warming the air, for the big bay is about frozen over. Even the Canadian Ice Service map, (which seems to be the last to show ice freeze in the fall and the last to see it melt in the spring, perhaps because they have a finer grid), shows the bay nearly completely frozen over. Besides Hudson Bay, Canada has its “other” Great Lakes, plus a vast number of smaller lakes and ponds, which show up as yellow specks (indicating they are frozen over) in this map. In conclusion, all those nice buffers, waters holding summer’s heat and steaming in the first cold of fall, have lost their ability to be the protectors of southern lands. Rather they help worsen the radiational cooling during the long winter nights, and have switched sides, turning from a foe of cold to a friend. It is for this reason that temperatures show no sign of uplift, as the shortest day passes and days start getting longer. Until those ponds, lakes, bays and seas start to melt a slight increase of sunlight not only has no effect, but the cold gets worse. On December 22 Faboo continued another 8.53 miles a little east of due south, finishing at 76.425°N, 11.881°W. This is pretty good progress, considering the winds died down from a breeze of 11 mph to slight draft of 5 mph. 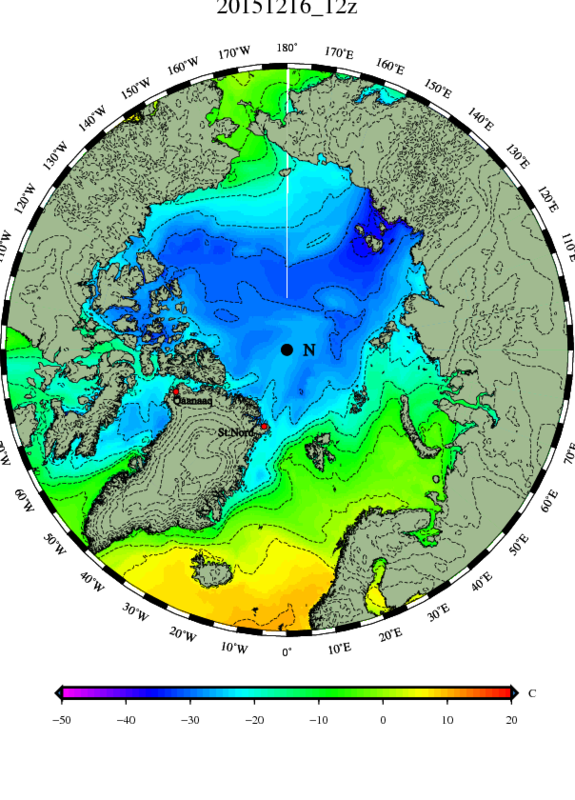 We never saw Faboo move so far when winds were so light in the summer, however at this point we are seeing a sort of accumulated momentum; the ice and sea-water remembers the gales of the past week, and now forms a current down the east coast of Greenland. It is sort of like when you stop stirring a cup of tea, but the tea keeps moving. The sea-ice is not frozen to a halt by sub-freezing temperatures, for Faboo saw a high of -21.5°C at the start of the period and a low of -25.3°C, and those extremely cold temperatures didn’t seem to slow Faboo a bit. On December 23 the winds started to pick up a bit, from 6 mph at the start to 20 mph at the end, and temperatures reached a low of -24.0°C at 0300Z and crept back up to -21.8°C at the end of the period (2100Z). We were shifted primarily south, with our eastward drift ceasing on 11.684°W at 1800Z and then starting westward again, as we wound up at 76.207°N, 11.702°W, which is another 15.31 miles further along. On December 24 strong breezes and cold temperatures lasted all day, with the breeze between 18 and 25 mph and the temperature between -21.4°C and -24.1°C. The buoy traveled another 22.19 miles, finishing at 75.890°N, 11.934°W. On Christmas the strong winds began to slack off in the late morning, gradually ebbing from 22 mph to 11 mph. Temperatures remained cold, sinking from -21.1°C at 0600Z to -24.1°C at the end of the period. Our westward progress halted on 12.100°W and we began to be nudged east again, as our general motion continued to be for the most part due south, finishing at 75.592°N, 11.978°W, which is another 20.56 miles on our way. On the past six days we have moved a hundred miles south from where this map shows Faboo located, back on December 20. 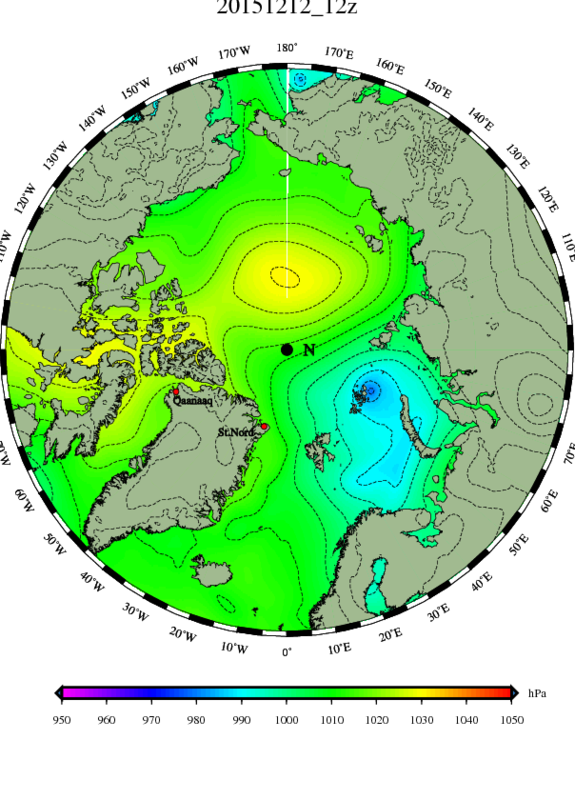 We are actually getting down to that next circle of latitude on the above map, which represents 75° north Latitude. We sure have been zooming, especially when you consider how long it took us to get across 85° north, and how there was even some doubt we would get into Fram Strait, or whether we’d get sucked west into the Beaufort Gyre. Well, all doubt has been removed, for now we are officially through Fram Strait, and farther south than the most southern point of Svalbard. In which case, you may ask, why follow Faboo any longer? There can be no doubt the buoy is on its way to to melting in the Atlantic south of Denmark Strait. Well, one reason to follow Faboo is that there seems to be a misconception about ice moving down the east coast of Greenland, especially because, in terms of “extent”, the ice forms a narrower and narrower band along the Greenland Coast. The misconception is that it is becoming a narrower band because it is melting away. If you open the above map to a new tab and then click it again you can get a very enlarged version. The orange lines are isotherms indicating the temperature of the sea-water, and show a lot of that sea-water is below the freezing point of fresh water. This includes the northern Barents Sea, the area of open water northwest of Svalbard, and the water moving down the east coast of Greenland. In fact the current moving south along the Greenland coast is one of the coldest in the world, as water that cold usually takes a dive, as it is so much denser than the warmer waters it moves into. 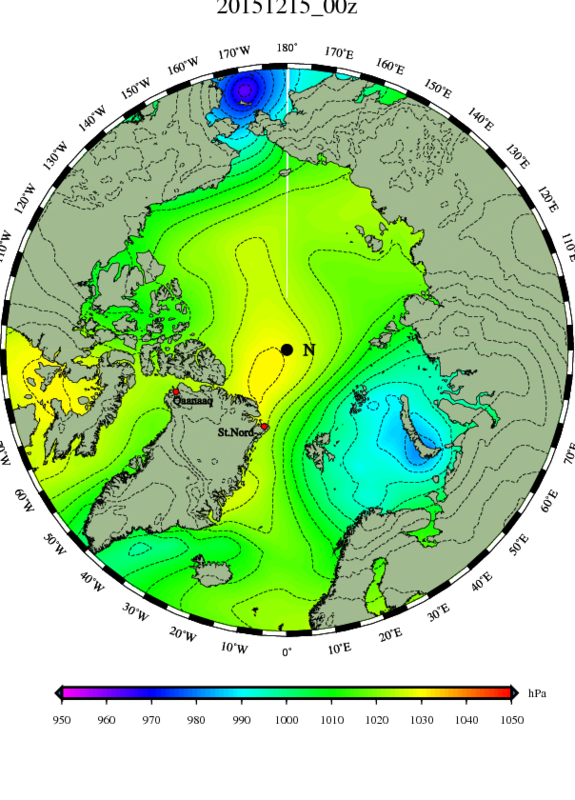 The question should then be, why doesn’t this Greenland current take a dive? Well, it actually does, further south, but at this point (where Faboo reports from) it doesn’t dive because it is fresher water, and also is not moving into warmer water yet. It is extremely cold salt water that could literally freeze your blood solid, and when it is blasted by steady winds of -20° to -25° there is no way any melting is going on. In fact every bit of ice in that water is like a candle’s wick being dipped in wax as it is made; it is growing, not shrinking. It is also (this year especially) piled up against the coast rather than spread out over the sea, which creates a jumble of thicker pressure ridges. In fact, compare the thickness of the ice along the east coast of Greenland last October 28th (top map) with today’s(bottom map). You may want to open these maps to new tabs and then click back and forth to compare them. What is clear is that a lot of the ice on October 28 is a lilac hue, indicating it is thin, only around a foot thick. Now it is a sky blue, indicating it is 5-6 feet thick, and even red right along the coast, indicating it is 12 feet thick. In conclusion, the ice moving down the coast of Greenland is not melting, though it is compressed to a narrower and narrow band along the coast, much of the time. This ice, as well as the ice moving down the east side of Baffin Bay and then along the coast of Labrador, has a power the water lacks. The cold water takes a dive, under milder waters, but this ice floats right over milder waters, which swiftly become colder, as does the air. (Mixed in with this sea-ice are calved-off chunks of Greenland glaciers, which make them especially dangerous to ships like the Titanic). Such ice-water currents also can mess up carefully prepared models of how colder and milder currents should behave, for they are in effect a cold current that refuses to take a dive. If a sizable raft of such bergs heads south they can create pockets of very cold water where, in theory, only milder water ought be, and if that water takes a dive much further south than models expect, you can imagine the frightful mess is makes of all the neatly drawn currents. The amazing thing is that Faboo is still somehow surviving to a degree where it still transmits pictures, though they still only show ink….though… perhaps… the late afternoon picture is a little less inky than the noontime shot? Arctic twilight peeking under clouds? Below you will see why true meteorologists have been known to sneak off during all sorts of important events to glance at maps, for I missed a few due to Christmas and an investigation of Obamacare, and I can see I missed a crucial switch from the cold air being penned up at the Pole to the Pole becoming a whirlpool sucking up our planet’s warmth. 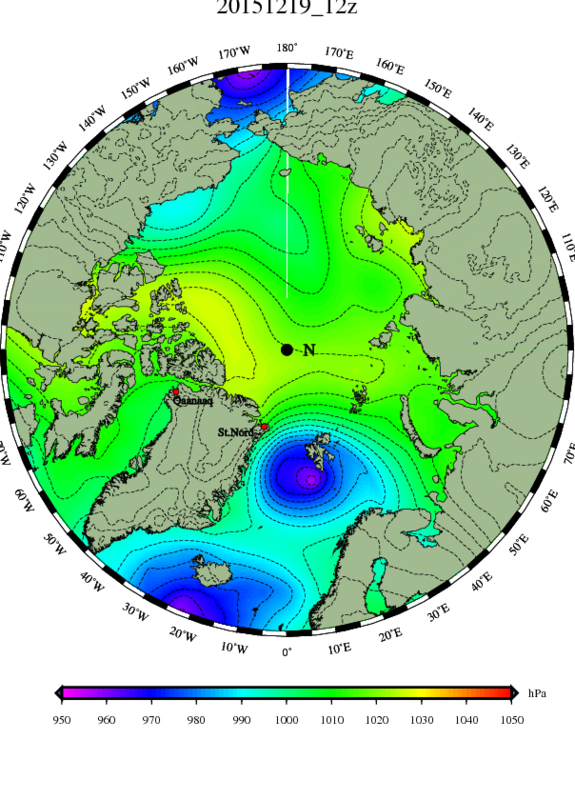 In the final map a new, smaller swirl is forming north of Greenland, as the major swirl collapses and fills in. What is most impressive is the huge amount of air chilled. Don’t forget it begins above freezing, so you need to add in all the latent energy released, first as the water vapor becomes liquid, and then as it freezes. Also a lot of uplift is occurring, so the heat is raised up to the tropopause, which is lower at the Pole. Perhaps the situation is analogous to a big, fat guy running to a swimming pool and doing a cannon ball at the center, and the splash being so big the pool winds up empty. Or maybe not. (I just like that image.) In any case what goes up must come down, and with all the air rising and cooling at the Pole air has got to be sinking around the edges. The situation aloft is very different from when we started this post. The “Polar Cell”, (if it exists at all and has not been replaced by a displaced “Ferrel Cell”), has been shunted down to Scandinavia. Once I start peeking and prying into the doings of the upper atmosphere I am outside my pay-grade, and basically should either shut up, of simply express wonder and awe, however I will note what I have noted, and that is that when lows roll up to the Pole, Cold gets spilled south, (like water in the Pool a fat guy cannon-balls.) And our mild December has ended here in New Hampshire with our first snow. 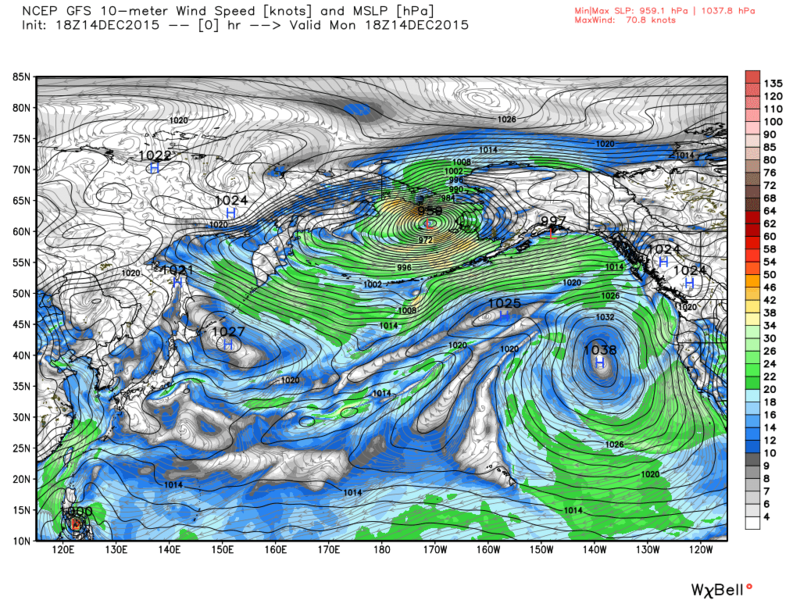 Note the high pressure poking up from the Pacific into Alaska, in the above map. 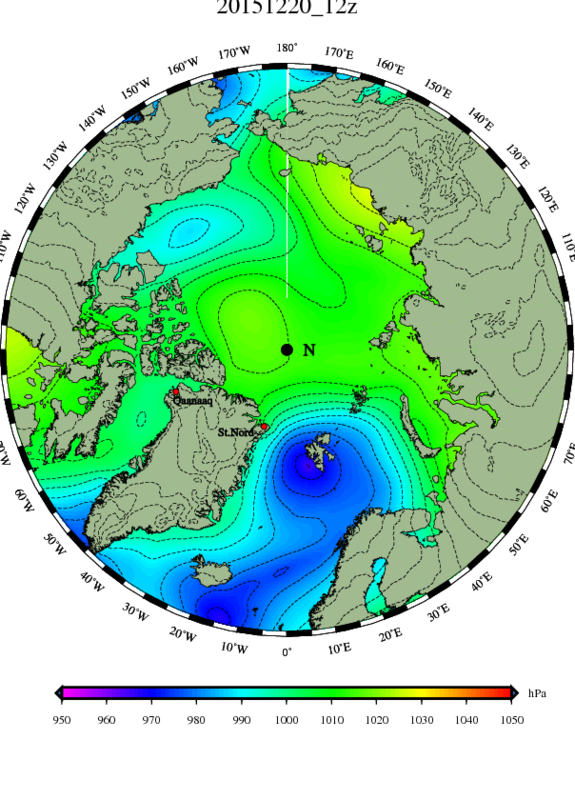 On the east side of such highs, arctic outbreaks can roar south. So I want it to go away, and kids want it to grow and bring more snow. So I check the map for midnight, when people in England are all shouting “Happy New Year!! !” Yuk. Sure looks like that high is building, and the flow will be north-to-south west of Hudson Bay. But maybe Chinook air will get sucked in, or maybe the outbreak will veer towards Labrador and out to sea. But how about that huge high north of Europe, at this 500 mb level? 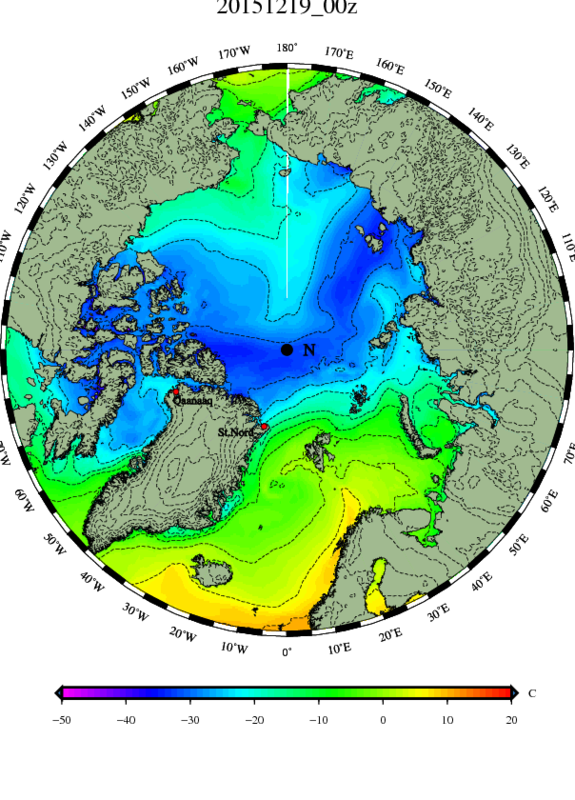 That may bring mild air to the Pole, but south of it, wouldn’t cold Siberian air start seeping east-to-west? In Europe, an east wind can come straight from Mordor. I suppose they have to refer to the Icelandic storm as a “freak” to generate interest. It is the same thing as calling it “unprecedented”. But they are careful to give no links to Weatherbell, or one might get all sorts of historical examples of similar situations with similar storms. That makes everything seem a bit humdrum, and I suppose some think no one will pay any attention if it has been seen before, and is actually used as an analog, to make Weatherbell forecasts. This is absurd. When an F5 tornado is heading down your street towards your house, it makes not a cotton-picking bit of difference if it is the first F5 tornado ever seen on earth, or the 94,612th. What matters is your survival, and the survival of those near and dear to you. What matters is what is actually happening. What matters is the Truth. For the Washington Post to refer to a impressive Icelandic low as a “freak” storm may increase the dwindling circulation of the rag, but anyone who has paid any attention to the North Atlantic knows that, if you call that huge gale a “freak”, then the North Atlantic is full of freaks. Even the brief period of NOAA records that the Post article refers to notes two storms with lower pressures. And one needs to be cognizant of the fact often the lowest pressure isn’t actually measured, but is estimated by a computer model. In 1977, when I lived in Maine, I met a man who had served aboard a Liberty Ship during World War Two. Liberty Ships were tough but lumbering cargo vessels that wallowed across the Atlantic, bringing supplies to England under the constant risk of being sunk by German U-boats. They also often got clobbered by North Atlantic Gales. This old man told me the ferocity of the gales was beyond description, as was the way they appeared out of nowhere, in areas where the weather map showed nothing but an innocuous-looking low the day before. They made the Liberty ships wallow nearly 180 degrees, from side to side, and a few ships simply vanished. Such ships were hastily built and not entirely well-designed, and the man had served on one ship where you could not get from the rear of the ship to the front without crossing a short stretch of open deck. During one stupendous gale he was ordered to come forward by the captain, so he had to cross the open deck. He tried to time his dash between waves, but was staggered by a blast of hurricane force winds and then a wall of unexpected water from an unexpected angle, and then, even though he tried to grip the railing with both hands and knees, was torn from the ship and hurled into the freezing cold water. He said he knew he was a goner. There was no way the ship could even think of stopping to look for a man overboard (it was not allowed due to the threat of German torpedoes, even if weather made it possible). He looked up the black side of the ship, seeing the dim light of the deck high above, and thought of his young wife back home and his parents and then, very suddenly, he was not looking up at the ships deck, but looking down at it. Then with a slam that broke his arm he was smashed right in front of the doorway to the forward part of the ship, and scrambled through to report to the captain. This is a good tale because it demonstrates that even the cruel sea has a merciful side. Quite incidentally it also demonstrates humongous gales have raged in the North Atlantic for decades, and the recent gale is no “freak”. Nor are the above-freezing temperatures surging up towards the Pole “unprecedented.” All you need to do is look back over my notes covering the past two winters to see other examples of warm air surging north. Not that I don’t think interesting stuff is being revealed to us. It is just that the Washington Post is, I fear, too seduced by the political agenda involved in the Global Warming hoax to see what is actually occurring. So what is actually occurring? What seems to be happening is unusual cold at the Pole, caused by unknown reasons, is clashing with unusual warmth in the Pacific, caused by unknown reasons. And yes, yes, yes, I know people like to think they understand the unknown reasons by sticking a name on it. It is like thinking you understand a spaced-out student by calling him autistic. You don’t really understand, but if you call the warm Pacific “the El Nino” or “the Blob”, then you can strut around like a school psychiatrist, pretending he understands the next Winston Churchill or Thomas Edison, when he doesn’t really have a clue. In like manner, the cold Pole can have a name stuck on it, and be called “due to the Quiet Sun.” And maybe that is a beginning of understanding, but we should not pretend we are authorities when, in actual fact, we are all novices. We should be more humble. The weather doesn’t care a flying flip about such debates, as far as I can see, and just proceeds on its own path. So…what is actually occurring? For one thing, a huge amount of heat is being squandered up at the Pole. The Washington Post may exclaim about temperatures above freezing, fifty degrees above normal, rushing up there, but if you look at the maps I posted above you will see how quickly that heat is lost to outer space. If you watch the maps over the next few days you will see temperatures over the Pole go down and down. For another thing, the bitter cold that was safely corralled up there is now dislodged south. Big changes are coming to Europe, which are described in detail by Joseph D’Aleo in one of his excellent blogs at Weatherbell. 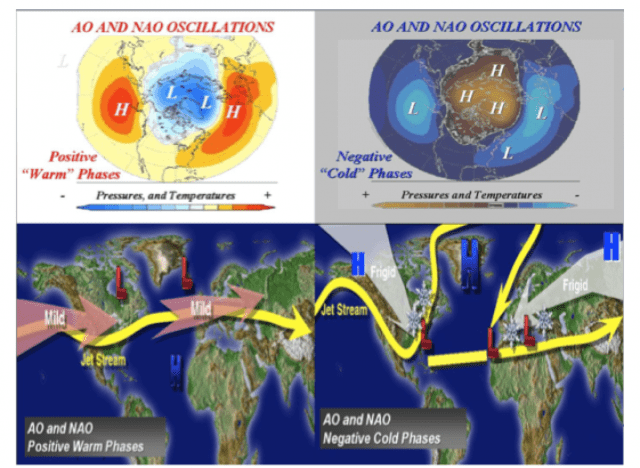 To put his detailed analysis in a nutshell, look at the two maps below, the upper map showing how above-normal temperatures could be in Europe, when the cold was safely corralled at the Pole, and the lower map showing the below-normal short-term future Europe faces, now that the cold is dislodged. What I hope you see is that the Washington Post is guilty of myopia, when it focuses on above normal temperatures at the Pole, without looking elsewhere. However I do think the surge of warmth north is very interesting, and well worth watching. And I do think that, while me may be novices, there is something to be said by those who suggest we are watching a war between above-normal temperatures brought about by an El Nino clashing with below-normal temperatures brought about by The Quiet Sun.